Produced and written by the band’s creative mastermind, Gerry Dantone, Universal Dice’s birth, love, hate, death sports sixteen tunes with strong musical and lyrical backbones aiding Dantone and his fellow musicians to realize the conceptual ambitions of the piece. Referred to as a “rock opera”, birth, love, hate, death doesn’t go from A-Z in a traditional storytelling mode, but fleshes out the narrative through assigning individual songs to characters within Dantone’s story. There’s a variety of sounds Universal Dice brings to bear for their latest release, but Dantone and his bandmates wear their influences on their sleeve – there’s some modern sounds here, but classic rock is, largely, the blueprint for this release with sounds reminiscent of The Who, The Beatles, etc, peeking out from the artistic mix. We don’t see albums like this in the mainstream much anymore. Besides the idea that rock is dead, thanks Gene Simmons and the Grammies, more and more artists of every musical type are increasingly building easily digestible releases. Not so for Gerry Dantone and Universal Dice. This aims high and finds its mark. It’s got great structure. Welcome to the World is the clear best choice for the album’s first song and sets up Dantone’s story with a minimum of fuss or bluster. His voice is one of the most compelling instruments in Universal Dice’s arsenal and has a quality that gets under listener’s skin from the outset. Dantone and the band seamlessly shift gears from a pleasing stride on the first tune into the balladic feel of the second song I Wish I Could Tell You. Anyone suspecting Dantone can’t handle softer material based solely on the first song will be proven wrong by this superbly arranged and deeply felt follow up. Your Son and The Prophet offer up evidence of Dantone’s ability to write within a character in such a way that it feels like the stakes are intensely personal, conveying that with his singing, and bringing it together with powerful, yet manifestly different, physically involving arrangements. His talent for pulling off intelligent yet utterly convincing rock and roll is in full flight from the first. His talent for arranging vocals is highlighted on songs like My Hands Are Tied and the album’s sole six minute plus cut Take Me Home. The seemingly simpler, more traditionally presented directness of the former song strikes a notable contrast with the more elaborate, even semi orchestrated feel of the latter. The extended length of Take Me Home affords Dantone room to roam as a singer. It pays off with one of the album’s stronger singing performances. I Know What I’m Doin’ is another vocal and songwriting highpoint and there’s a light edge of understated menace permeating the tune. There’s also a strong swagger that brings the song closer to listeners than what have otherwise been possible. Honestly is a big piano ballad with cascading, swaying arrays of chords carrying the audience from one passage to the next and Dantone’s voice gives it just the right amount of ragged glory. Universal Dice bring birth, love, hate, death to a close with an acoustic driven tandem of tunes, One Day at a Time and Forever, that avoid any hint of the expected pat endings some might assume Dantone is tempted to settle for. They bring the album’s narrative to an unexpectedly graceful ending, actually, when you consider much of the artful, but more than a little raucous at different points, rock and roll Dantone and the band serve up over the preceding fourteen tracks. Universal Dice’s fourth album is a swing for the fences, without a question, but it comes off totally natural sounding throughout and never succumbs to excess. 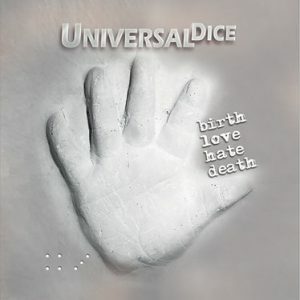 If you enjoyed a preview from Universal Dice’s birth, love, hate, death check out the official website for the band by clicking here. Give them a like on Facebook by clicking here.